How did you become a bridal designer? What’s your design background? My mother worked in the fashion industry, and my auntie had her own atelier – growing up the house was always filled with fabrics, patterns and sewing machines. After my degree I completed my Masters at the Royal College of Art where I focused on experiments with textiles and hand embroidery. Following this I studied intense creative pattern cutting and forecasting at the London College of Fashion and Central Saint Martins. In a professional capacity I worked in womenswear, heading up teams in London as a Design Director working with a number of brands, retailers and bespoke consultancy work, within the UK and internationally. I unexpectedly got into bridal design in 2011 following my own wedding, when I struggled to find ‘the’ dress. What I wanted was not available so the process of creating my dream dress started with me doing a sketch in a coffee shop and that’s how my bespoke journey began. 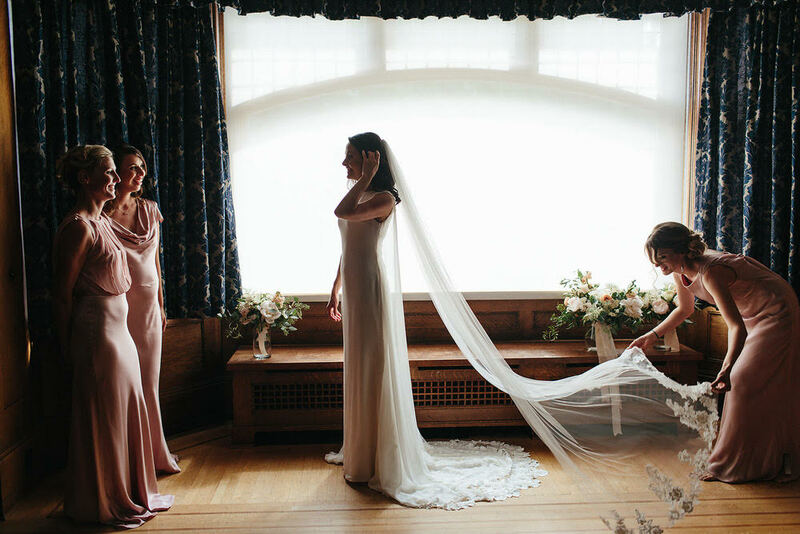 Later that year a friend asked if I would consider designing and making her wedding dress, which I did, and in 2013 after a year of word-of-mouth bespoke bridal creations and recommendations I founded Julita LDN Bride. For bespoke creations the inspiration is mainly from the bride herself. Designs reflect personality, drawing on everything as individual as each bride-to-be that equally exists outside of the current trends and tradition. Details are embedded within the design. I have produced creations which have been inspired by love stories, tales of magical mermaids, enchanted scenes and childhood memories. Each dress has a story and personality and some have incorporated family heirlooms such as lace and pearls used within a design adding so much personal sentiment and romantic ideology, making each bespoke dress truly unique. How does the bespoke design process work for you? The bespoke process is a creative journey, a personal design collaboration between the bride and myself, where our minds will meet to develop a unique vision. This is followed with a sketch that also outlines the fabric, trims, details and embellishments as selected and agreed in our initial consultations. After taking detailed measurements, a calico toile or similar mock fabric, will be made. The design may evolve throughout the numerous toile fittings required to create the final pattern, and to ensure the gown fits perfectly. All gowns are couture and hand-made. The dress will then be cut in the final fabric. Once the main dress shell is finished, all the bespoke embellishment and detailing will be added. My belief is that a dress is never one-dimensional – it must be beautiful at every angle. Embellishments, beading and embroidery are at the heart of my work, and in turn the dress becomes a piece of art. Do you have a particular type of bride? Free-spirited brides with a dreamy sense of adventure, inspired by romance, moonlight and magic! They seek something modern, yet timeless. 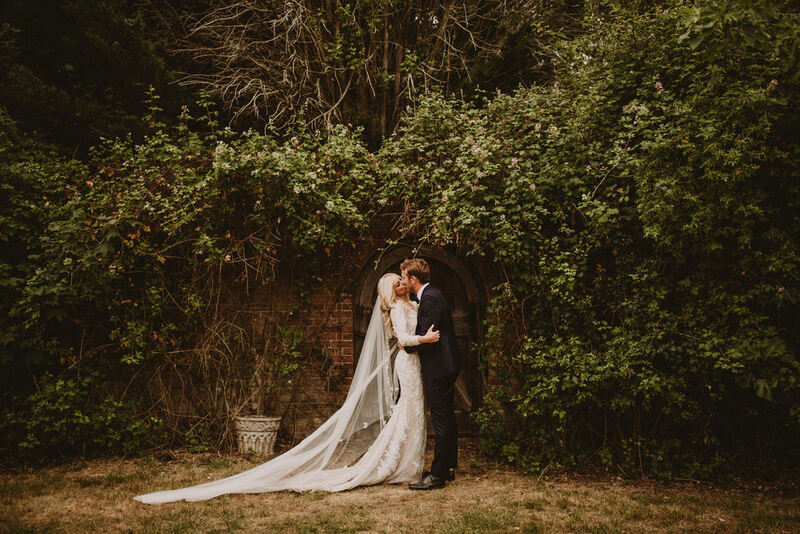 My brides have a very relaxed and open-minded – which is needed when you go down the bespoke couture route – you need to believe in the process and understand how it can evolve as an art form. Most importantly they are fun – our meetings are always filled with laughter and excited gasps – I have made so many wonderful friends through working and designing gowns for like-minded ethereal souls. Are there any fabrics you love to work with and why? Endless lengths of silk weightless georgette – the crepe finish offers such a delicate semi-sheer matte vintage sensibility. The drape is so elegant and romantic. I love deconstructing lace – reworking layered elements alongside dying techniques and beading to create something new and intricate – creating unique appliqués and highlighting these with bead work. Your dresses are all beautifully fluid – is it important to you that a bride can move freely in one of your gowns? My designs are very soft, unstructured and contemporary. Creative pattern cutting techniques and working with the natural properties of fabrics to create the silhouettes desired. Drape is key – exaggerated, long and sweeping. Brides must be true to themselves – and in order to do this they need to feel comfortable, and this goes beyond the physicality. 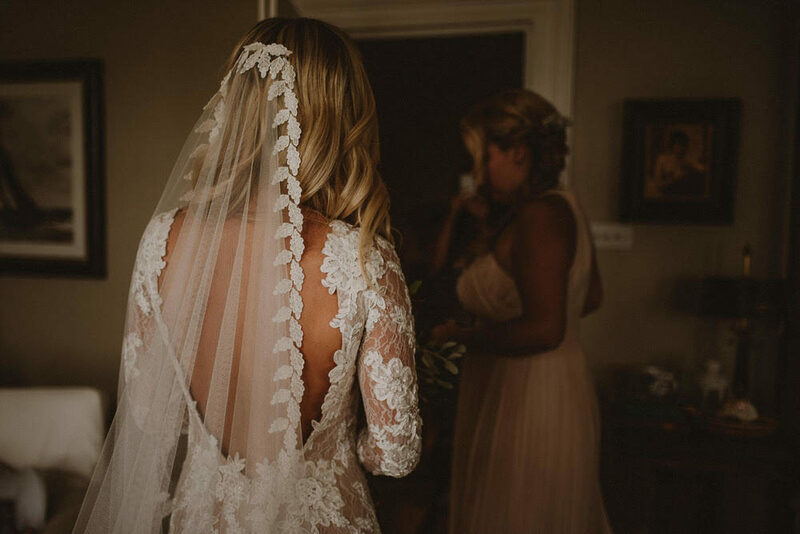 How you feel wearing something has a huge impact on how you feel emotionally – designs must reflect the brides personal style and let her confidence shine through. In order to move freely in your gown you need to have that emotional connection with it, and what better way to do this than having a bespoke gown that reflects your best version of yourself. Do you have a favourite gown you’ve created? I have loved each one of them – they have all been so different. Without exception my favorite part of the process is the embellishment stage. 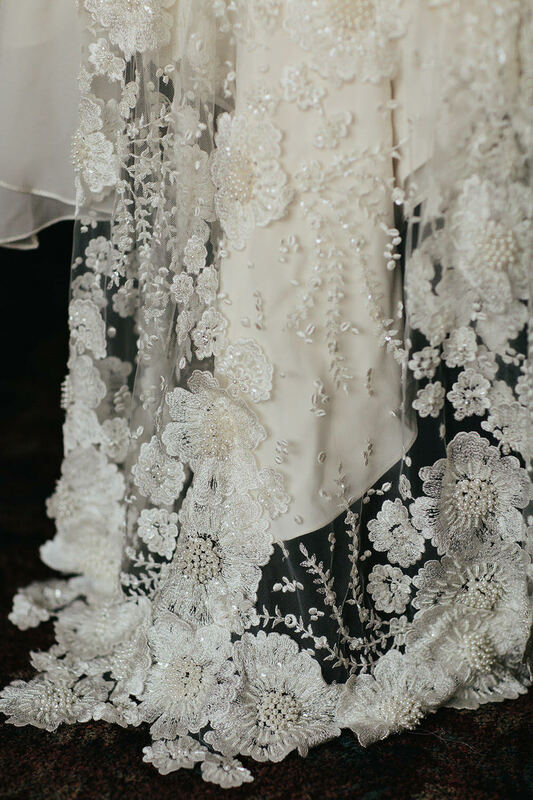 I will happily spend hours deliberating over every detail, whether it’s the placement of a lace trail or a beaded cluster – it’s an absolute labour of love for me. I will keep repositioning whilst taking photos to document each stage and option until it’s visually balanced and ‘feels right’. It can take weeks to fully embellish a gown – but seeing the design come together and evolve is the most magical part of the process. It drives me. It’s such an honour to design the most important dress of someone’s life, it’s a very special time for the bride and it’s such a pleasure to be a part of someone’s wedding journey. The room is filled with excitement and love – and that’s a beautiful thing! No day is ever the same – every gown is unique and the labour intensive work that goes into designing and making the gown is the fuel for my soul. I meet the loveliest people, at one of the happiest positive times of their life. There are no restrictions, it’s a pure creative escape and freedom for expression. What’s the future direction for Julita? I’m currently in the process of designing a capsule collection in order to offer 3 tiers of service. This will include the fully bespoke couture design, semi bespoke and a made to order core line. I am driven by the desire to make something beautiful. Are there any iconic women you’d love to design for? I would have loved to design a dress for the Mexican artist Frida Kahlo. Her paintings had strong autobiographical elements and mixed realism with fantasy. She explored questions of identity, gender, relationships, class, and race in Mexican society. Self-portraits communicated pain and passion, and bold, vibrant colours. Her gown would have to be something dramatic, exaggerated and unexpected, with symbolic appliqué, perhaps intricate beaded guipure lace details and fringing. Kahlo portrayed her vivid dreams, thoughts and experiences through her art, imagine this interpreted into her gown. The gown would have to be accessorised with a vibrant inspired floral headpiece bursting and celebrating bold colour. Sensational! Thanks so much to Jo for answering my questions, if you’re considering the bespoke option for your dress, or if appointments at bridal boutiques have left you wanting more – then PLEASE do get in touch with Jo. She’s a great listener and works really closely with you to create a dress that will truly make you feel fabulous. Jo at Julita LDN Bride is such a talent, I’m really excited to see what the future holds for her! I predict big things…and I can’t wait to see RMW brides wearing her creations!